Vocal Trash Drawstring Bag. Dimensions are 15" X 15", consist of two drawstrings and can be worn like a backpack, or taken as your reusable bag to the store. 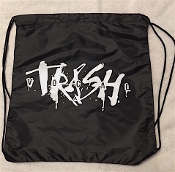 Show you support as you are "Out on the Town" with our new Vocal Trash logo bag. Copyright © 2008-2019 Vocal Trash. All rights reserved.